The former president is accused of having received R$3.7 million worth in bribes from OAS contractor via renovations of a triplex apartment in Guarujá Beach. 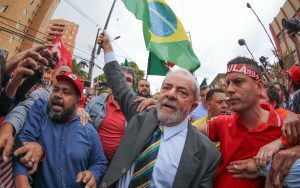 SÃO PAULO, BRAZIL – Former president of Brazil, Luiz Inácio Lula da Silva, testified on Wednesday before Judge Sergio Moro for more than five hours and denied any knowledge of wrongdoing and obtaining benefits from contractors in the Lava Jato (Carwash) corruption scheme. Former President Luiz Inacio Lula da Silva arrives in Curitiba to testify about corruption scheme, photo by Ricardo Stuckert/Instituto Lula. Oscillating from irritable to calm, the former leader said there was no proof that he knew of wrongdoings at Petrobras and that he received benefits from his influence with government officials. “If I committed a crime, prove that I committed a crime,” said Lula at one moment in the testimony. “Present it [the proof] to society and Lula will be punished as any citizen is punished. But, for God’s sake, present a proof. Enough with the innuendos,” complained the former president. The former president is accused of having received R$3.7 million worth in bribes from OAS contractor via renovations of a triplex apartment in Guarujá Beach, located in São Paulo state. In return, say prosecutors, the company would be favored in contracts. Lula denies being the owner of the apartment in question. While the former president testified in a court building in the center of Curitiba, hundreds of supporters and allied politicians waited outside. Among the allies who came to Curitiba to support him was former President Dilma Rousseff. A heavy security apparatus was put in place for Lula’s testimony. According to the Secretariat of Public Security of Paraná about 1,700 are military police officers were placed in strategic points in Parana’s capital to keep the two groups (those for and those against the former leader) apart. According to state officials, approximately 6,000 Lula supporters were at hand to follow the testimony. In all, 128 buses were said to have come from several states of the country. Groups opposed to the former president also went to the city, but in much smaller numbers. After testifying Lula participated in a political rally in downtown Curitiba. During the rally, Lula once again denied any wrongdoing. “I want someone to prove the apartment is mine,” he said.